Drawing said to depict educator Mary Ann Adams Conkling (1816-1871). Image used courtesy of the Southern Lorain County Historical Society, “The Spirit of ’76” Museum. Happy holidays, dear readers! 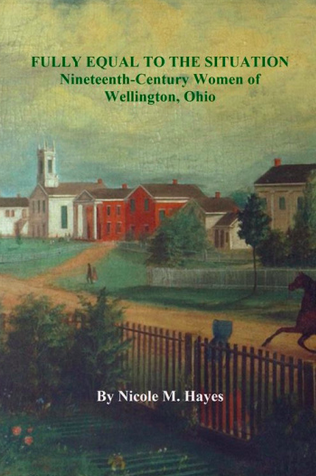 It is a very busy season at the best of times, but even more so this year as I promote and distribute copies of my new book, Fully Equal to the Situation: Nineteenth-Century Women of Wellington, Ohio. Sales have been going well thus far and I am tremendously grateful to everyone who has supported the project. While organizing and filing research materials to clear the decks for 2018, a.k.a. Bicentennial Year, I realized I had several images that I have not posted to the blog previously. And a few of them had common subject matter: they were portraits of women. As a general rule, I try to include as many visuals as I can reasonably insert when writing a post. I personally enjoy looking at period images, and they go a long way toward humanizing and grounding any piece of writing. But there have been occasions when I decided not to include an image, usually due to space constraints, but sometimes because the image did not seem sufficiently relevant to the topic at hand. An unintended consequence of this decision was that more than once, I did not use an illustration that depicted the spouse (read: wife) of a subject. Given the topic of the book I just published, that was an omission I felt I had to rectify. The portrait at the top of this post falls into a slightly different category. Mary Ann Adams Conkling was the subject of a lengthy post about her local school for girls, the Wellington Seminary. But I did not become aware that this drawing existed until long after the post was published. The study is in the collection of the Southern Lorain County Historical Society and is currently on display in their second-floor exhibition about area schools through the decades. I encourage you to visit and see it in person. Journalist and newspaper publisher Mary Hayes Houghton (1837-1921). Image from “The Houghton Genealogy,” written and published by Dr. John Houghton in 1912. I have also written a bit about Mary Hayes Houghton, in connection with her husband, Dr. John Houghton, and the period of time during which they co-edited the Wellington Enterprise. In those posts, I used a photograph of Mary Houghton taken late in her life. She was not yet forty when she and John purchased the Enterprise, so the image above is a more accurate reflection of what she would have looked like at that time. Eliza Jane King Rininger (1820-1902). William Rininger was one of the wealthiest businessmen in Wellington for decades. He had dry goods shops in at least two locations on what is today East Herrick Avenue. I have written about his reputation as a cantankerous and confrontational man, and the public squabbles he engaged in during his thirty-five years in the village. I know very little about his personal life, and even less about his wife, Eliza. I initially found her portrait attached to a burial record for the Rininger family mausoleum in Attica, Ohio. I have subsequently discovered that there are at least a half-dozen studies that remain of the well-to-do Mrs. Rininger, which can be found online appended to the genealogy records of family descendants. Estella Le Hentz Rasor Sawtell (1843-1909). Image used courtesy of the Southern Lorain County Historical Society, “The Spirit of ’76” Museum. This final portrait is also one of which I became aware only after the relevant post was published. Estella Sawtell was married to local photographer and amateur artist, William Sawtell. I know little about Estella beyond the fact that she suffered from very poor health, dying of intestinal cancer six months after her husband passed away. Her adult life was filled with hardships, including the poor physical and mental condition of her spouse (who voluntarily committed himself to an asylum for two years) and the loss of her only son to tuberculosis at age twenty-two. I presume her husband shot this portrait, which now belongs to the Southern Lorain County Historical Society. If you are interested to learn more about the female citizens of Wellington in the 1800s, my book of biographical essays on a dozen people–including pioneers, social reformers, and yes, even a doctor–is available for purchase online and in person at “The Spirit of ’76” Museum. I am also pleased to announce that the Oberlin Heritage Center will be carrying the title in its gift shop in 2018. This is likely my last post of the year, so get ready everybody! BICENTENNIAL will be here in just ten days! This entry was posted in Genealogy, History, Ohio, Wellington on December 21, 2017 by Armchair Historian.